Afghan security forces inspect the site of a Taliban-claimed deadly suicide attack in Kabul, Afghanistan, April 19, 2016. 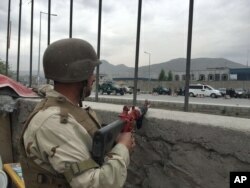 A group of Taliban insurgents staged a bomb and gun attack in the Afghan capital Kabul Tuesday morning, killing at least 30 people and wounding more than 327, according officials. The assault targeted a building, which officials say houses a special unit of the Afghan security force working under the Afghan spy agency and responsible for protecting government officials. The attack began at around 9 a.m. local time with a suicide bomber detonating his explosives-laden vehicle at the entrance. Interior Ministry spokesman Sediq Siddiqi told reporters "hundreds of kilograms of explosives" were packed in the vehicle. He said investigations are still underway to determine details about the number of attackers but admitted security lapses led to the deadly assault. Officials said the ensuing intense gunfight between the assailants and Afghan security forces lasted for several hours and left all the attackers dead, with some blowing themselves up. An Afghan soldier responds to a Taliban-claimed suicide attack in Kabul, Afghanistan, Tuesday, April 19, 2016. Afghan President Ashraf Ghani has condemned the attack "in the strongest possible terms" and said many people have been killed and wounded. He said the attack "clearly shows the enemy's defeat in the face-to-face battle" with Afghan security forces. The Taliban claimed responsibility for the violence, with a spokesman, Zabihullah Mujahid, saying all three attackers were wearing suicide vests. In a statement sent to reporters, the Taliban said the assault targeted the Afghan intelligence agency’s office, calling it “one of the brutal and inhuman organs” of the Kabul government. Mujahid said the suicide bombing made way for other heavily armed Taliban suicide attackers to enter the building and engage personnel of the intelligence agency in a gunfight. The insurgent group often issues inflated details of attacks against government and military targets. During the White House briefing in Washington, Press Secretary Josh Earnest strongly condemned the “cowardly attack on Afghan forces and civilians.” He said the United States remains committed to supporting the Afghan people and government. “We also call on the Taliban to pursue a pathway of peace instead of continuing a military campaign responsible for the senseless deaths of Afghan civilians,” Earnest told reporters Tuesday. The White House spokesman says he didn’t have an updated assessment as to what impact, if any, the attack would have on the U.S military posture going forward. But Earnest noted U.S. strategy in Afghanistan will be among the important policy decisions of President Obama’s successor. Afghan officials immediately pointed fingers at Pakistan, blaming the neighboring country for not delivering on its commitments to uproot Taliban sanctuaries on Pakistani soil. Islamabad rejects the allegations, citing counterterrorism operations underway to secure volatile tribal areas near the Afghan border. The deadly assault prompted Afghan Chief Executive Abdullah Abdullah to postpone his official visit to Islamabad. Abdullah was due to under take the trip on May 2 at the invitation of Pakistani Prime Minister Nawaz Sharif, officials said. "After initial evidence of today's suicide attack in Kabul, CE Dr. Abdullah decided to postpone his upcoming visit to Pakistan," said an announcement posted on Abdullah's official Twitter account. Television footage showed a thick plume of black smoke rising from the area immediately after the powerful blast, which took place not far from the presidential palace and the sprawling U.S. embassy complex in Kabul. The U.S. Embassy released a statement Tuesday, condemning the attack. "Afghanistan deserves peace and security, not attacks that victimize parents taking their children to school, workers on their morning commute, and people who have stepped forward to help defend their fellow citizens," the statement read. The NATO-led Resolute Support mission in Afghanistan "strongly condemned" the assault. “Today’s attack shows the insurgents are unable to meet Afghan forces on the battlefield and must resort to these terrorist attacks,” U.S. Army General John Nicholson, Resolute Support commander. Afghan security forces responds to a Taliban-claimed suicide attack in Kabul, Afghanistan, Tuesday, April 19, 2016. 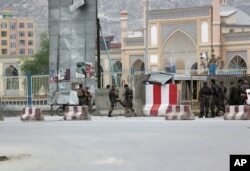 The incident comes as Taliban insurgents have intensified battlefield attacks in more than 15 Afghan provinces as part of their annual spring offensive. The United Nations condemned the attack, saying it is verifying facts on numbers of civilian casualties. "Taliban use of huge bomb in a densely populated area shows total lack of respect for civilian live," said the U.N. Assistance Mission in Afghanistan (UNAMA). In a report released Sunday, UNAMA said that the Afghan conflict caused about 2,000 civilian casualties in the first three months of this year, including 600 dead. Neighboring Pakistan, where Afghan officials said Taliban leaders are sheltering, also condemned the bloodshed. "We extend our heartfelt sympathies and condolences to those who have lost their loved ones and pray for an early recovery of the injured," a foreign ministry statement issued in Islamabad said, and reiterated that the government "condemns terrorism in all its forms and manifestation."